On Monday, August 7, 1978, God released a special assignment to the earth: Stephanie Nicole “Byrd” Grant-Lowe. She was born to her proud parents, Mary Ann Embry Smith and James Edward Grant, Jr. at the Talmadge Memorial Hospital in Augusta, Ga. The assignment which seems to us to be so short-lived was nearing its completion. On Saturday, February 2, 2019 nonetheless the assignment was finished. 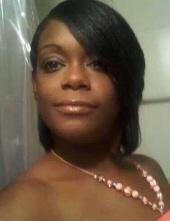 Our dearest, Stephanie Nicole “Byrd” Grant-Lowe entered into eternal rest at the University Hospital-McDuffie in Thomson, Ga. The windows of Heaven opened and welcomed our beloved Stephanie, a wonderful daughter, granddaughter, sister, mother, aunt and friend home. Byrd, as she was affectionately called by family and friends, received her education by attending the Columbia County School System of Georgia. She wore a smile that would light up the darkest room. Byrd had a way of making you laugh and or cry. She could so to speak put-you-in-your-place if need be. Although she was small in stature, she was big in voice, and never felt intimidated. Of all the things she enjoyed in her life, she loved her family and friends most. Stephanie Nicole Grant was united in matrimony to Glenn T. Lowe on Monday, October 15, 2001. From this union, three children were born. She is preceded in death by her mother, Mary Ann Embry Smith. Those left to cherish a lifetime of beautiful memories: her estranged husband, Glenn T. Lowe of Augusta, GA; six children, Shardai Nicole Grant, Teairay LaShay Gordon, her precious little Miracle Imani Demmons, all of Thomson, GA, Glenntoria Nicole Lowe, Glenntavious Tyrone Lowe and Maryianna Jasmine Brianna Grant, all of Augusta, GA; a grandson, Chase D’Amoni Andreco Sturgis of Thomson, GA; father, James Edward Grant, Jr. of Thomson, GA; two sisters, Jennifer Lynn Embry and Celeste Nicole Grant, both of Thomson, GA; a grandmother, Jettie Mae Embry of Thomson, GA; a special someone, David Demmons of Thomson, GA; a host of aunts, uncles, nieces, nephews, a great-niece, other relatives and many sorrowing friends. To send flowers or a remembrance gift to the family of Stephanie Nicole "Byrd" Grant-Lowe, please visit our Tribute Store. "Email Address" would like to share the life celebration of Stephanie Nicole "Byrd" Grant-Lowe. Click on the "link" to go to share a favorite memory or leave a condolence message for the family.